Plaintiff's attorney Allen Smith cross-examines an expert witness for Johnson & Johnson on Tuesday as jurors prepare to hear closing arguments later this week. Click here to see video from the trial. St. Louis - Closing arguments in a closely-watched trial over the alleged cancer risks of Johnson & Johnson’s popular talc-based personal hygiene products are scheduled for Thursday in Missouri state court and will be webcast live by Courtroom View Network. The high-stakes trial began on October 4th, and is just the third talc powder case to go before a jury in Missouri after plaintiffs landed ground shaking verdicts earlier this year of $72 million and $55 million. Whether or not J&J notches a win in this case could help shape the terms of any eventual large-scale settlement. Approximately 1200 talc powder cases are pending in centralized dockets in Missouri and New Jersey, and 54 pending federal cases were recently consolidated into multi-district litigation. While a third consecutive plaintiff’s win could put J&J in a far weaker position going into any settlement talks, a victory for J&J could warn plaintiff attorneys that the company has finally cracked the code for successfully defending talcum powder cases in St. Louis. A key factor in plaintiff Deborah Giannecchini’s trial that plaintiff attorneys are likely playing close attention to is a shakeup in J&J’s trial team. During the previous two Missouri cases, J&J’s defense was headed by Butler Snow LLP and Shook Hardy & Bacon LLP. This time the world’s sixth-largest health care company turned to Texas-based Beck Redden LLP and Nelson Mullins Riley & Scarborough LLP. Giannecchini’s team consists of the same firms that represented plaintiffs in the previous Missouri talc trials, Beasley Allen Crow Methvin Portis & Miles PC, and The Smith Law Firm PLLC. If that same team lands a third consecutive multimillion win despite a new slate of defense firms, J&J could become far more cautious about taking additional cases to trial in St. Louis, with more dates pending for 2017. Another defendant in the case, Imerys Talc America Inc., is represented by Gordon & Rees LLP, which convinced two previous Missouri juries not to assign any liability to the company that supplied J&J with the talc used in their products. Giannecchini, 63, alleges J&J knew talc particles could travel to the ovaries and cause cancer, but withheld the information from the public due to the popularity of brands like Johnson & Johnson’s Baby Powder and Shower to Shower. Giannecchini developed stage four ovarian cancer after applying talc powder to her genital area for decades. The trial nearly didn’t go forward after J&J removed the case to federal court barely a week before the start of jury selection, arguing that Giannecchini’s case had been improperly consolidated with other claims before St. Louis Circuit Court Judge Rex Burlison. The plaintiffs responded with an emergency motion to remand the case, which U.S. District Judge Jean C. Hamilton granted after a hearing held via telephone. Although J&J lost their bid for a last minute delay in the Missouri case, they did successfully scuttle what would have been the first talc powder trial in New Jersey, where J&J has its headquarters and where most talc cases outside of Missouri are pending. That trial was also scheduled for October, but Atlantic County Superior Court Judge Nelson Johnson dismissed the case in September after finding the plaintiffs lacked sufficient medical evidence to support their claims. The New Jersey dismissal makes the Giannecchini trial that much more significant, since it would likely make Missouri the preferred forum for newly filed talc cases. After jurors sided with plaintiffs in a second case talc in May, Beasley Allen claimed in media reports to be swamped with nearly 5000 similar claims. Missouri’s standards for admitting expert testimony are less stringent than New Jersey’s, with much greater deference given to the jury. Judge Johnson’s dismissal of the New Jersey case was based on excluding testimony from two of the plaintiffs key experts who previously testified in St. Louis. 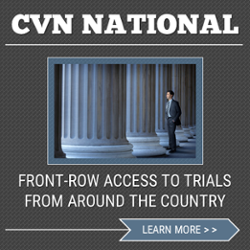 It is unclear which specific attorneys will deliver Thursday’s closing arguments, or what if any different approach J&J’s team will take after their two previous losses, but CVN will be recording and webcasting the full proceedings gavel-to-gavel. The case is Tiffany Hogans, et al. v. Johnson & Johnson, et al. The case number in the U.S District Court of the Eastern District of Missouri is 16-cv-01470. The Missouri state court case number is 1422-CC09012-01.